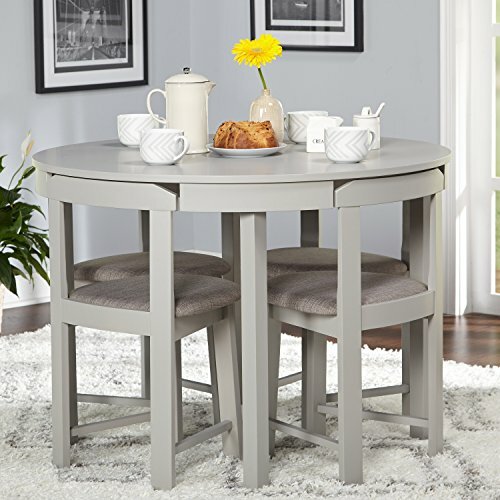 The Tyler 4-PC counter height dining group is a perfect fit for any dining area or breakfast nook. Gently sloping seats provide comfort. Two-tone finish in black and cognac add to the design. 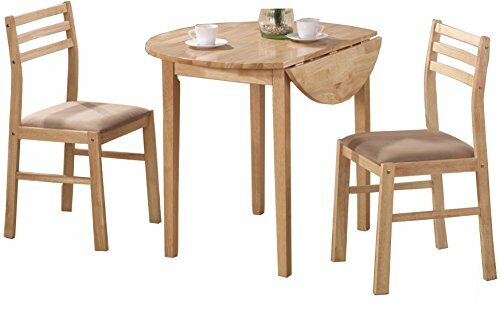 Upgrade your living space with this simple yet versatile dining set. The timeless design of the set will add elegance to any kitchen or dining area. With an easy-to-clean tempered glass tabletop and 4 metal chairs with tufted cushioning, it ensures comfort and long-lasting use. 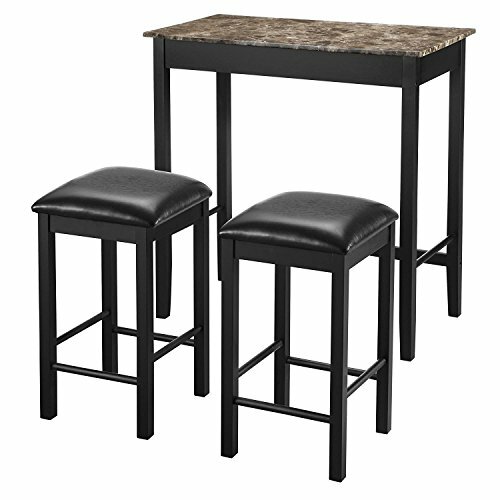 Make this set a mainstay in the home for countless family gatherings!Specifications:Table Dimensions: 47"(L) x 27.5"(W) x 30.75"(H)Chair Dimensions: 22"(L) x 16"(W) x 37"(H)Seat: 15.25"(L) x 16"(W)Floor-to-Seat: 18"(H)Backrest: 20"(L) x 13.5"(W)Chair Weight Capacity: 250 lbs.Table Weight Capacity: 80 lbs.Table Weight: 36.1 lbs.Chair Weight: 35 lbs. 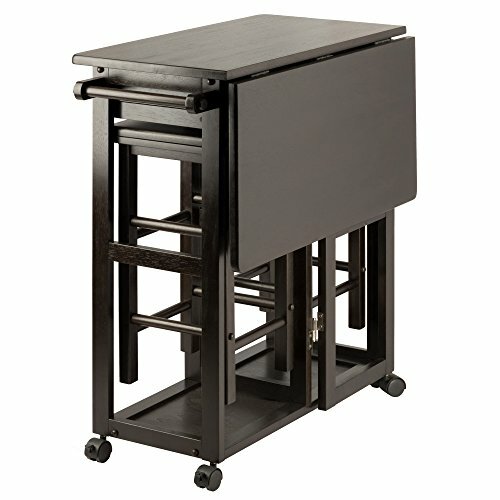 (total)Table Material: Steel, GlassChair Material: Steel, PU LeatherShips in 2 boxesAssembly required (with instructions)Package Includes:Table(4) ChairsBCP SKU: SKY3059Ships and arrives in 2 separate boxes. Delivery times may vary per box. 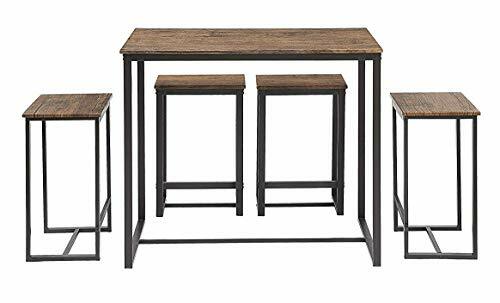 This 5-piece counter height table dining set is a convenient, space-conscious way to maximize seating in any kitchen or dining space. 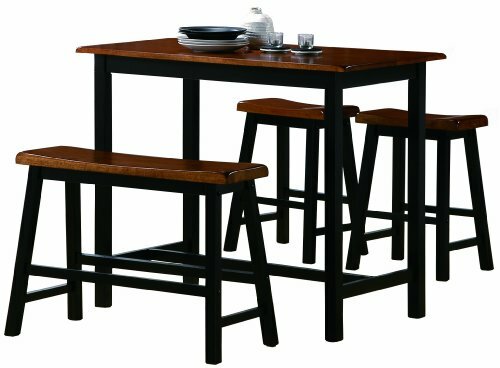 The dining table set with stools features a modern rectangular shape and stunning walnut finish that is perfectly complemented by a sleek, black metal frame. The thoughtful counter height table allows all 4 stools to neatly tuck away after use. As a sturdy, highly functional kitchen, dining, or pub table with a delicately attractive aesthetic, this 5-piece table set is the perfect piece for any home. 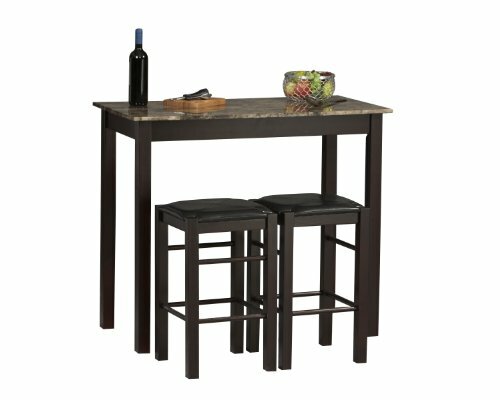 Looking for that perfect pub table set to round out your home bar? Look no further than this counter height table and stool set with a unique rustic design. Make a kitchen table, dining table or pub table set out of this attractive, multifunctional space-saving seating solution. With its ability to conserve space, this dining table with stools can supplement your existing seating without adding unnecessary clutter. Simply tuck the stools under the table when they aren't in use for easy storage and maximum living space. This lovely dining set lends an elegant touch of simple sophistication to a kitchen or breakfast nook. It comes complete with a lovely, round dining table and two comfy chairs upholstered in soft, light brown, padded fabric. The table is enhanced by a versatile drop-down extension which can be raised to accommodate an elaborate dining setup. Lowering it allows you to cozy up closely with a special someone over a leisurely breakfast or romantic, candlelit meal. 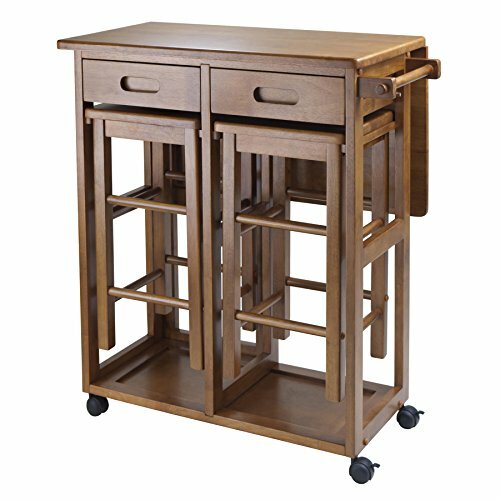 A smooth, polished, natural wood finish gracefully complements the sleek, stylish silhouette of this beautiful three-piece set. Crafted to complement the decor of virtually any small dining space with mid-century flair, this five-piece dining set comes with four chairs and a round dining table. The chairs are curved to conveniently tuck right under the table. Finished in a warm walnut with easy to clean black faux leather upholstered seats, this set is constructed of sturdy rubberwood for increased durability. 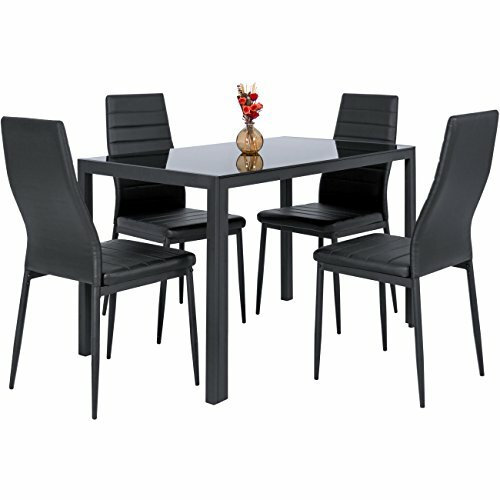 Features: Round shaped Includes 1 round table and 4 chairs with curved backs Upholstery made with faux leather Polyester foam fill Ships in 2 cartons Mid-century style Made with rubberwood, MDF, veneer, and faux leather Assembly required Walnut finish Black and brown color Dimensions: Table: 29.6 inches high x 41.3 inches wide x 41.3 inches deep Chair: 28.75 inches high x 16.5 inches wide x 16.5 inches deep Seat height: 17.5 inches Seat: 16.5 inches wide x 15.8 inches deep This product will ship to you in multiple boxes. Shopping Results for "Winsome Space Saver"